Carol and Monty met in 1989, and have been collaborating and inspiring each other and the art glass community ever since. In 1991, they took a lampworking class together, and unlike everyone else in the class, they brought Bullseye to work with, instead of Moretti. This resulted in a very different type of bead, and it changed their lives forever. After that fateful class Monty and Carol decided to hide away and work without exposure to other beadmakers’ work. Fish were fun and became and became one of their first experimental subject beads. By fanning out their tails and mixing colors, these little fish turned into more than beads—they turned into sculpture. One day, Carol decided to make a bead that was just a tail and no fish, and the “Lola” bead was born. This first Lola bead was only about one inch around but was definitely something special. Not to be outdone, Monty made a four-inch Lola, and then a five year adventure of sculptural beadmaking began. Any bead they could sculpt with a big pair of tweezers and their imaginations, they created. In designing their focal glass beads, Monty and Carol take direction from the sculptural forms of nature. They are inspired by flora, the botanical works of Carl Faberge, and other Art Nouveau styles. Monty and Carol adapted the use of Bullseye and Uroboros 90 COE glass into their beads. This glass performs better in sculptural work, since it is stiffer and holds its shape without rounding out. They also started mixing small amounts of dichroic glass into their work. This addition resulted in a sellout of beads at their next few shows, and has continued ever since. Their current beads include flowers, leaves, and various sculptural forms, as well as fused glass beads and jewelry components. Their work naturally led them to begin their business of distributing dichroic glass and other glass supplies and to the formation of Dichroic, Inc.
Monty has a master’s degree in Art and Sculpture for California State University Sacramento. He teaches glassworking and metalworking at American River College in Sacramento, California, and has previously owned two commercial jewelry stores. Carol is a skilled glassworker and jewelry designer, having sold a successful line of jewelry for several years. 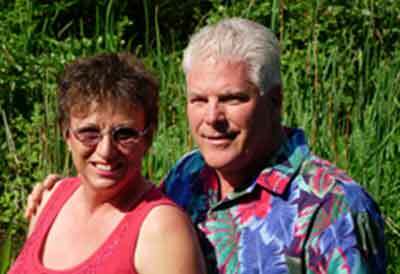 Monty and Carol’s works have been published in several books and many magazine articles. Their work is currently featured in a new book by Jim Kervin, The Lampwork, Fused and Carved Dichroic Beads of Carol Fonda & Monty Clark.